Many time national record holders in many classes including V-8, V-6 and Inline 6 cylinder catagories. 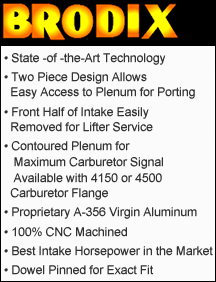 Inventors of cylinder head bolt plug kit(Port Intruder) sold exclusively by Brodix Cylinder Heads and Self Racing. patented Kits available for all smallblock heads! Dealers for : Brodix Cylinder Heads, Dart Cylinder Heads, Jesel Inc., Competition Cams And Eagle. Inventors of the Air Tool Muffler. Patented and sold exclusively by Self Racing. Mufflers are CNC machined from aircraft aluminum and will fit any airtool with rear exhaust. Excellent for porting tools, drills aand cutoff saws.